I often get asked about about the latest diet trend or food related fad so I thought I would write a blog post to direct all the queries too (It also meant I could eat a donut for the pic below!!!!). My personal opinion is that diets don’t work and it is better to follow a healthy balanced diet for the majority of the time. However, balance is they key word! 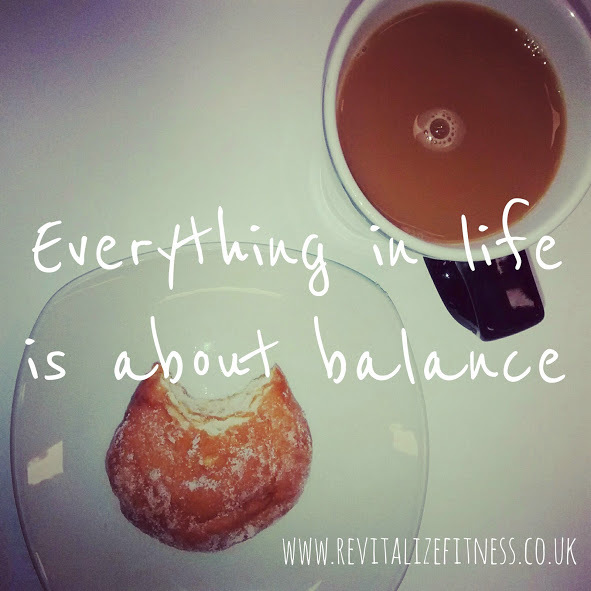 If you feel like eating a donut, go for it but before you all go rushing out to Krispy Kreme remember that balance. As long as you eat a healthy diet most of the time and you have no weight or health concerns, then the occasional treat will do you no harm! Below are some tips that I offer to clients trying to stay on track with nutrition. And stop when you are full! Listen to your body and respond to its needs. Think of your body like a car, if you don’t put the fuel in it won’t go!! It’s recommended that we eat at least five portions of different types of fruit and veg a day. It’s easier than it sounds. A glass of 100% unsweetened and not from concentrate fruit juice can count as one portion, and vegetables cooked into dishes also count. Try adding chopped banana into your breakfast cereal, or swap your usual mid-morning snack for some dried fruit?. Fish is a really good source of protein and contains loads of vitamins and minerals. Aim for at least two portions a week, including at least one portion of oily fish. Oily fish is high in omega-3 fats, which may help to prevent heart disease. You can choose from fresh, frozen and canned, but remember that canned and smoked fish can be high in salt. Oily fish include salmon, mackerel, trout, herring, fresh tuna, sardines and pilchards. Non-oily fish include haddock, plaice, coley, cod, tinned tuna, skate and hake. Anyone who regularly eats a lot of fish should try to choose as wide a variety as possible. Most people in the UK eat too much sugar. Sugary foods and drinks are often high in calories and could contribute to weight gain. They can also cause tooth decay, especially if eaten between meals. Cut down on sugary fizzy drinks, cakes, biscuits and pastries, which contain added sugars: this is the kind of sugar we should be cutting down on rather than sugars that are found naturally in foods such as fruit and milk. Food labels can help: use them to check how much sugar foods contain. More than 15g of sugar per 100g means that the food is high in sugar. Even if you don’t add salt to your food, you may still be eating too much. About three-quarters of the salt we eat is already in the food we buy, such as breakfast cereals, soups, breads and sauces. Eating too much salt can raise your blood pressure. Use food labels to help you cut down. More than 1.5g of salt per 100g means the food is high in salt. Adults and children over 11 should eat no more than 6g of salt a day. Younger children should have even less. We need to drink about 1.2 litres of fluid every day to stop us getting dehydrated. This is in addition to the fluid we get from the food we eat. All non-alcoholic drinks count, but water, milk and fruit juices are the healthiest. Avoid sugary soft and fizzy drinks that are high in added sugars and can be high in calories and bad for teeth. When the weather is warm, or when we get active, we may need to drink more to replace fluids lost through sweating. Some people skip breakfast because they think it will help them lose weight. In fact, research shows that eating breakfast can help people control their weight. A healthy breakfast is an important part of a balanced diet and provides some of the vitamins and minerals we need for good health. Porridge, with fruit sliced over the top, is a tasty and nutritious breakfast. We all need some fat in our diet. But it’s important to pay attention to the type of fat we’re eating. There are two main types of fat: saturated and unsaturated. Too much saturated fat can increase the amount of cholesterol in the blood, which increases your risk of developing heart disease. Saturated fat is found in many foods, such as cakes, pies, biscuits, sausages, cream, butter, lard and hard cheese. Try to cut down, and choose foods that contain unsaturated rather than saturated fats, such as vegetable oils, oily fish and avocados. Wherever possible make all meals from scratch, this includes healthy snacks. Pre-packaged food is often packed with preservatives to extend the shelf life. If you can buy your food from local suppliers this is even better!